Went for a walk with a visiting friend on the bayou in Buffalo Bayou Park recently. Aside from the barren ruin of the landscaping from the Harvey flooding, it’s jarring to have summertime weather with empty, leafless trees and vegetation. But there in the bank along the walkway some tiny violets had sprung out of the sand. And if there were violets, there were going to be wild chives. And there were! Growing everywhere. Couldn’t help grazing and munching on the tender little onions. Later on a stroll through the Old Archery Range — that part of Memorial Park just west of Loop 610 at Woodway — we saw what at first looked like fields of orange flowers poking up through the leaves. Upon closer inspection the flowers turned out to be mushrooms, odd column-like things poking out of an egg-like sac. There are some delicious mushrooms growing in Memorial Park and along Buffalo Bayou, including the armillaria tabescens (or ringless honey mushroom) and the beautiful white oyster mushroom. But this wasn’t one of them. The strange fungus was definitely not edible. 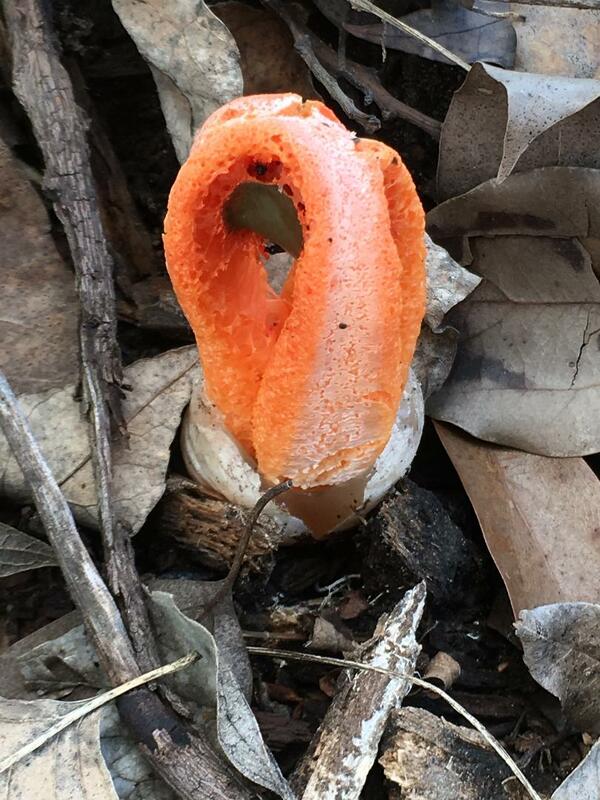 Our nature advisors Tom Helm and Bruce Bodson identified it as an octopus stinkhorn or “devil’s fingers.” Definitely not edible. And definitely did not smell edible. Especially after sitting forgotten in a plastic bag in a purse for a few days. In order to fix our very bad flooding problems, we need to understand what they are. A wide-ranging study, proposed by the US Army Corps of Engineers, would look at where raindrops fall and how they flow across our roofs, yards, parking lots and streets, through our drainage systems and waterways and into Galveston Bay. It would analyze where the problems are and help us agree on the best solutions. The cooperative project, first proposed to the city and county in 2015, now appears to be moving forward. Edmond Russo, deputy district engineer for the Galveston District of the Corps of Engineers, reports that federal funding for the Metropolitan Houston Regional Watershed Assessment is in place. The district expects to receive word from headquarters in Washington, D.C. within several weeks. The Feb. 9 passage of the federal budget also provided funds for the long-awaited study of improvements to the troubled Addicks and Barker dam and reservoir system on Buffalo Bayou in west Houston. 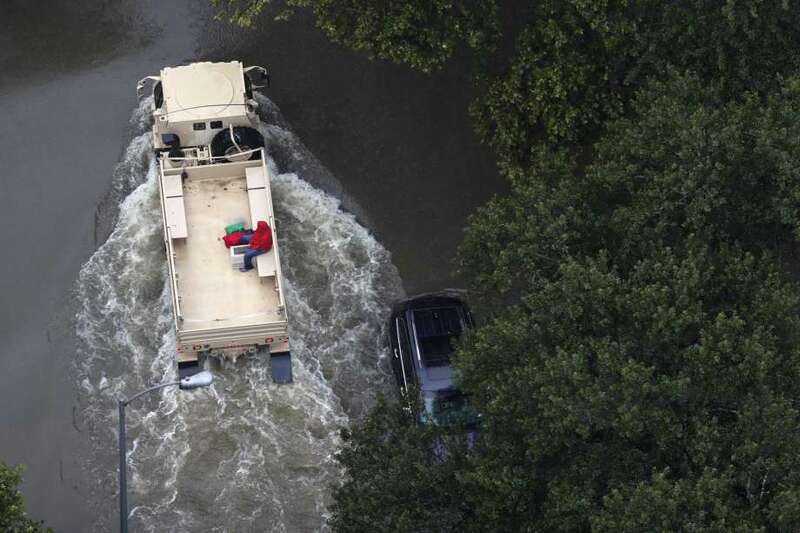 Engineers were forced to open the floodgates of the aging, earthen dams in August when an unprecedented amount of rain runoff from Harvey threatened to overwhelm the dams. Three people died and thousands of homes and businesses were flooded. Russo says the two studies would complement each other. The study has the potential to move the Houston region’s outdated flood management practices into the modern era. Flooding begins on the land. The focus of flood risk reduction elsewhere – including even Fort Worth – is on managing flooding in place, stopping stormwaters before they flood rivers and streams. That means slowing the flow. It means educating people about rain runoff and helping them be stewards of their own watershed. It means swales and rain gardens instead of lawns, more trees, vegetation, and green spaces instead of impervious surface, opening up ravines and streams filled for development, buying out properties and widening the floodplains of our streams, and more. Houston and Harris County leaders continue to emphasize bigger drainage pipes and channelizing, widening, and deepening our bayous and streams to “improve” conveyance and flush more water downstream as fast as possible. Scientific experts widely agree that this approach, costly to the taxpayers as well as the environment, causes more flooding and erosion. Russo, in a recent telephone interview, spoke passionately about a “comprehensive approach,” a “range of ideas,” “a suite of solutions” and “actions at various levels,” including cisterns, porous concrete, green buildings, the possibility of redesigning golf courses on Buffalo Bayou for detention, water features for detaining floodwaters, “managing all this water as far upstream as we can … before it gets to the bayous.” He pointed out that “a tiny bit of improvement across the whole drainage network could equal another reservoir.” He spoke of bringing together different planning bodies, community groups, the city and county flood control, bayou coalitions, landscape architects, hydrologists, and engineers, of using Housing and Urban Development grants and other federal funds as well as tax breaks for green infrastructure and assistance to homeowners and others to make changes to their homes and property. Buffalo Bayou is the main river flowing through the city of Houston, the center of some 22 interconnected watershed systems, most of which drain into it. The bayou itself is part of the larger San Jacinto River watershed. 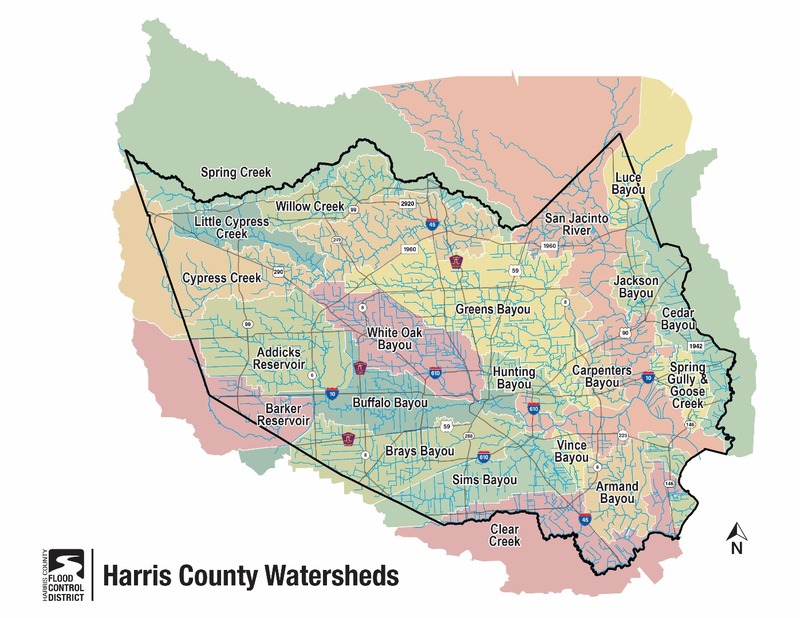 The Harris County Flood Control District has signed a Letter of Intent to be the non-federal partner in the project, sharing twenty-five percent of the cost. The goal is to have “everybody singing off the same sheet of music,” said Russo. The Corps of Engineers is not widely admired, particularly here after the disaster caused by the unprecedented opening of the floodgates of the federal dams on Buffalo Bayou during Harvey. The Corps has a reputation for ruining rivers, arrogantly ignoring natural systems, destroying the environment, and building projects that fail. “The Corps is going to come up with engineering solutions,” commented a skeptical acquaintance working on flooding issues. Harris County Commissioner Steve Radack, whose Precinct 3 includes the dams, complained in a recent interview of the impact of a decade of foreign wars on the ability of the Corps to address domestic issues. The public has until March 5 to comment on proposed changes to Chapter 19, the section of the city code that regulates building in floodplains defined by the Federal Emergency Management Agency. 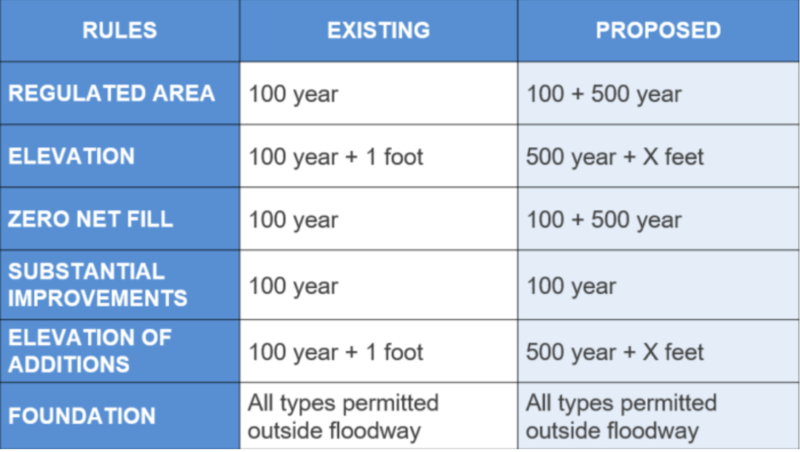 These are the so-called 100-year and 500-year flood hazard areas that few people seem to understand, including members of the Houston City Council who met last Monday to hear about the proposed changes. Actually there was a lot city council members didn’t seem to understand, including who was on the Flood Czar’s Drainage and Redevelopment Committee, how long they had been meeting, and what they were talking about. The Flood Czar himself, Steve Costello, officially known as the Chief Resilience Officer, addressed members of the Transportation, Technology, and Infrastructure committee and the Regulation and Neighborhood Affairs committee. Remarkably, Costello appears untarnished by the Houston Chronicle report that he and his engineering company helped develop plans for subdivisions behind the reservoir of Barker dam that they had to know would flood. The city’s director of Public Works and Engineering also addressed the council members and made a presentation about the proposed changes. Carol Ellinger Haddock was appointed as director last month after serving as acting director since July 2017. The previous director had served about two months. Other administrative positions remain unfilled. City council members angrily objected to the brief period for public comment on the changes proposed by Haddock. The draft changes already had been reviewed for comment by developers and builders. The public comment period, initially set to end on Feb. 19, has been extended to March 5. 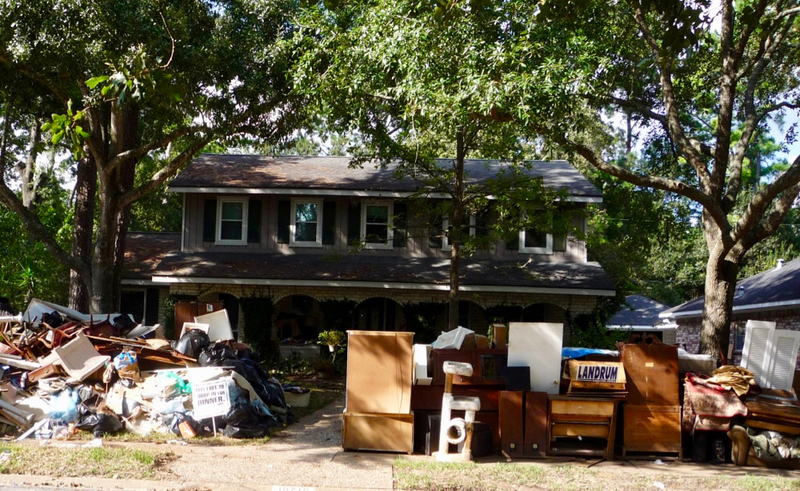 Proposed changes to City of Houston floodplain ordinance known as Chapter 19. Image COH. Interested in how buying out hopelessly flood-prone buildings can help with our flooding problem? The free public program is sponsored by the Greater Houston Flood Mitigation Consortium. The conference is scheduled for 7 to 9 p.m. at the BioScience Research Collaborative, 6500 Main Street in Houston. Though free, registration is required. Register here.